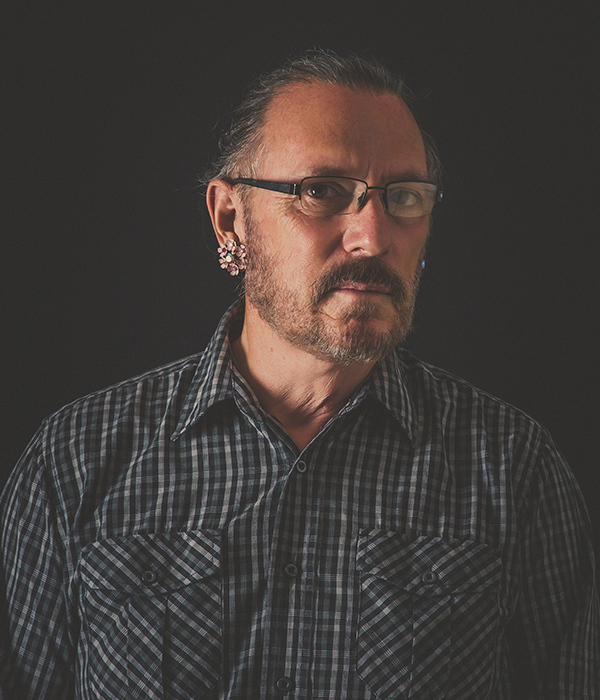 John Rankine will create Men With Earrings, a portrait series of people in the community of Eureka Springs, AR who identify as male wearing an assortment of clip-on earrings challenging perceived notions of gender and identity. This collection of 60 works will include a solo exhibition, and limited edition book and poster. John Rankine is a mixed-media artist, photographer, and writer who hails from Toronto, Canada. He shows at Eureka Fine Art, a Eureka Springs cooperative gallery he operates with seven other artists. For the past four years, he has curated monthly art exhibitions at Brews, a coffee/craft beer and gallery establishment. As a photojournalist, Rankine documented the community of Eureka Springs, Ark., for eight years in the Lovely County Citizen, a weekly newspaper he co-founded in 2000. Rankine has shown in numerous solo and group exhibitions including the large scale installations “A Community at Peace,” “Graven Images,” and “On My Morning Walk.” In 2011, Rankine was awarded the Arkansas Arts Council’s Individual Fellowship for Outstanding Achievement in the Arts for his multi-media photo installation, “A Community at Peace.” He is a past recipient of a Canada Arts Council grant. Over his career, Rankine has worked in textiles, found object assemblage, photography and other mediums. A retrospective of his art was held in 2005. Rankine lives with his husband in a straw bale house they built together just outside Eureka Springs with their three dogs, a small herd of goats and a flock of chickens.